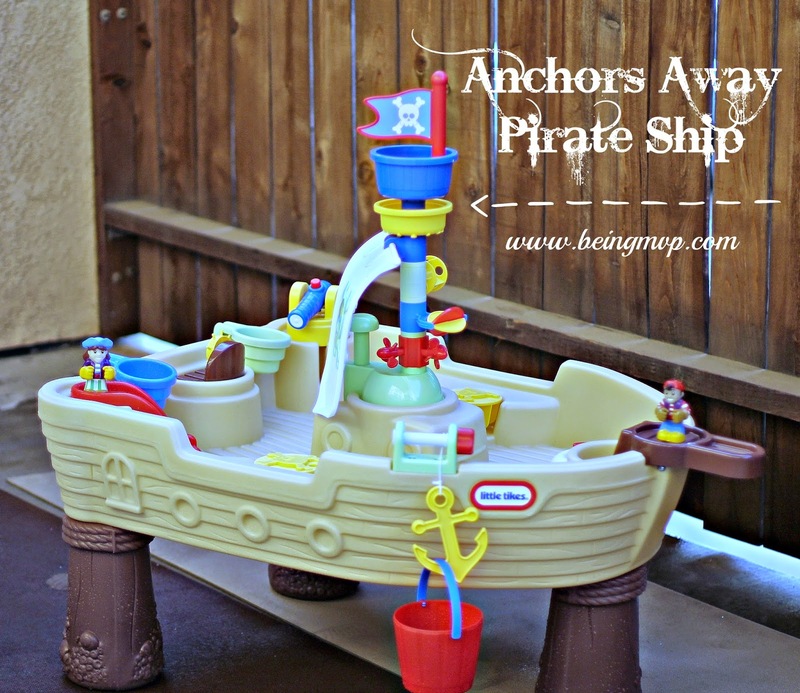 Disclosure: I received the Anchors Away Pirate Ship from Little Tikes for review. All opinions are my own. I suppose we are lucky to live where the climate is nice year round. The kids can play outdoors until dinnertime as well as head to the parks and beaches on the weekends. 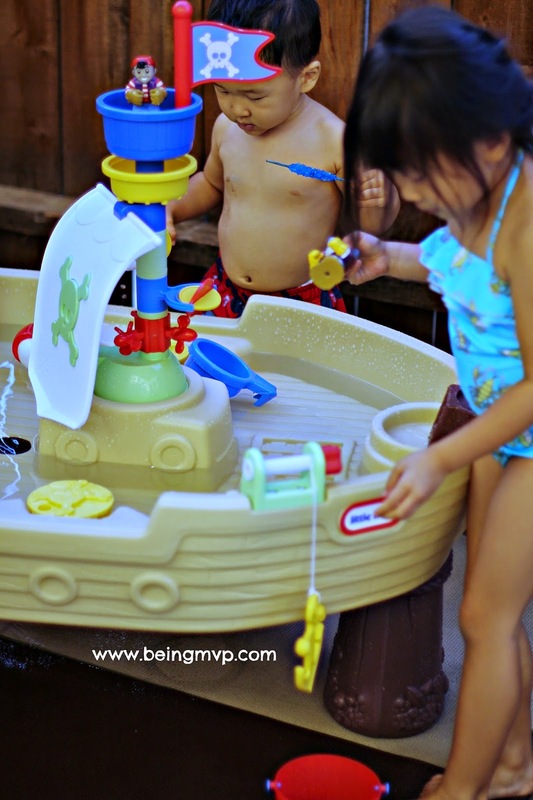 They also enjoy any sort of water play and were delighted to see the Anchors Away Pirate Ship from Little Tikes. I assembled it upstairs in no time when it arrived and they played with it sans water for a few weeks before I hauled it down the steep stairs outside. This pirate water table from Little Tikes is awesome. It has so many features that will keep your kids happy for a while. The construction is durable as all the Little Tikes products we have and the functional parts and accessories bring out the giggles and smiles. The detachable scoops and characters with boat and life raft are played with indoors as well as outdoors. The anchor with the crank is a really fun feature. The squirting cannon does come off easily but can be snapped back in quickly. The water pump works but does require some effort. Kenzie likes to just pour water from the top to let it trickle down over to spin the gears below. Hey, however they want to play right? They did not want to come in even when it was dinnertime! Are your kids obsessed with all things water like mine? Would they enjoy the Little Tikes Anchors Away Pirate Ship? OMG!!! This is the CUTEST EVER!! That looks like so much fun! I bet my kiddos would love a pirate adventure. Great sensory and imaginative play. My son loves pirates. This is so adorable. Ahhh! That is adorable and looks like so much fun! My kids had a very primitive version of that when they were little. This is so cool, I need to get one for my boychild he would love this. My kids love playing in the water! We have this and my kids love it! My kids would have stood for hours at that when they were little! It looks like they are having a lot of fun! This looks like so much fun. Too bad it is getting cooler because I'd spread sunscreen on my kids and send them out to play with this ALL summer long. It''s getting cooler here in Indiana but next year my son will be 2 1/2 then and I'm planning to get a water table. He would love this one because he loves his Jake and the Neverland Pirates. This is so colorful and cute! My kids would have loved this when they were young. This is darling! Your kids are too cute, love the giggles. Nicely done video, it's great to see it in action. Such a cute toy, I wish my kids were young enough for this, it would make a great Christmas gift! We had one similar a few years ago but never this decked out. My kids would love this. What a fun water table! My grandsons would love all of the gadgets on here! Oh my gosh, this is the cutest and coolest water playset that I've ever seen! I love it. Hello! How adorable are your children playing with this fun toy?! I've always thought Little Tikes toys were fun and durable. My son had several. Now, my grandson would love to have this for he and his friends! Thank-you for the review! We love our water table! My son doesn't even need water in it to enjoy it. Great investment.